So for Halloween I decided it was time to catch up on some ‘horror’ films I hadn’t had the chance to see for a variety of reasons. 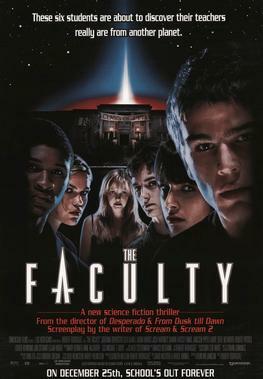 For the first film, I went back to 1998 to watch ‘The Faculty’, a sci-fi horror masquerading as a high school drama that I’d somehow managed to miss in my youth. Directed by Robert Rodriguez, the film features a stellar cast who have mostly gone on to have steady careers and it’s a film that wears its influences firmly on its sleeve. The film begins at Herrington High School in Ohio, where the teachers are having a budget meeting after the kids have gone home. When the principal (Bebe Neuwirth, or Lilith from ‘Frasier‘ to me) returns to pick up her keys, she is attacked by a fellow teacher, who has been seemingly possessed by something extraordinary. The film then draws back to introduce us to the students, who all fit your generic high school character stereotypes: you’ve got the nerdy kid (Elijah Wood), the hot girl (Jordana Brewster), the jock (Shawn Hatosy), the stoner (Josh Hartnett), the outcast (Clea DuVall) and the new girl (Laura Harris). ‘The Faculty’ has a lot of fun subverting the tropes of both the high school genre and the sci-fi horror genre, and it’s fun identifying the various films that influenced different moments. The film seems to split opinion based on the review aggregator sites I had a look at and if you’re judging the film purely as a sci-fi horror then I can get that, but the film seems to be playing around with the trappings of the genre more than trying to fit into it. The films got a great soundtrack drawn from music of its time period which compliments Marco Beltrami’s score, and the performances are a lot of fun throughout the cast, with a young looking Jon Stewart a particular pleasure as the science teacher. The casting of Piper Laurie (‘Carrie’, horror) and Robert Patrick (‘Terminator 2: Judgment Day’, sci-fi) also plays into the film’s influences, given their iconic rules in two of the key touchpoints of the genres ‘The Faculty’ is trying to ape. The narrative isn’t particularly difficult to work out, although it does have a couple of tricks up its sleeve, as the story follows the ‘pick them off one by one’ formula, often by particularly gory methods. ‘The Faculty’ is a messy movie, but it’s an entertaining movie and I enjoyed it a lot.